Boston-based startup Loop is introducing yet another smartphone payments technology in an already extremely crowded market. Given that in-store mobile payments have hardly taken off, it might seem Loop is flogging a dead market, but it has a unique approach to the digital wallet. Loop’s core app doesn’t require its own dedicated transaction network. Instead it’s merely trying to virtualize the plastic we all carry around in our wallets, letting consumers virtually ‘swipe’ them at any check-out stand the same way they would their credit, debit, gift and loyalty cards. 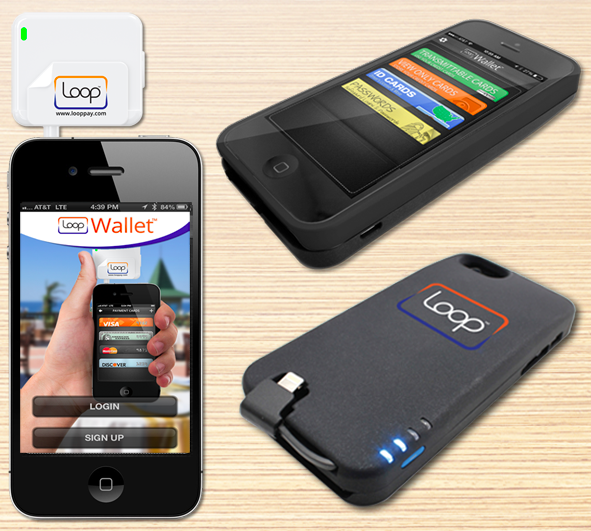 Loop is riding over the existing point-of-sale equipment and payment processing networks retailers already use. Basically Loop is creating a contactless payment system that tricks any magstripe reader into thinking a physical card is being swiped. Though, the system doesn’t require any specialized hardware or software at the point of sale, it does require the consumer to invest in hardware. A card reader is necessary to load the card’s magstripe signature into the phone, and a special case or smartphone-connected fob is required to produce the magnetic field that emulates the card swipe. Loop says that eventually its magnetic secure transmission technology will be embedded directly in mobile phones, eliminating the need to carry around any specialized hardware. But that strikes me as extremely wishful thinking. Some device makers like Apple(s aapl) are still reluctant to embed near-field communications (NFC) chips into most phones. It’s highly unlikely they would embrace a proprietary technology that works with a single app. Requiring consumers to invest in specialized hardware is a huge obstacle to mass scale adoption, but if it works, Loop’s technology has other things going for it. It claims that its app can be used at 90 percent of existing point-of-sale systems – that’s saying a lot. One of the main reasons the mobile payments market has been so lackluster is that customers can use the technology in relatively few places. From a convenience standpoint, it’s just must easier to carry plastic. Tech startups, internet giants like Google(s goog) and payments companies are all search for the Holy Grail of mobile wallets. The only company that’s really made an impact so far is Starbucks(s sbux), and you can chalk its success up to ubiquity. Starbucks mobile payment apps and digital gift cards work in any location. PayPal(s ebay) in part has modeled its forthcoming in-store payments system on the Starbucks’ QR code approach. PayPal announced today it would field a new version of its mobile app next year that will work for any merchant that accepts Discover Card(s dfs). I hope you’ll see the innovation here and cheer on the team from Loop. Thanks! This is pretty sweet, I always forget my wallet at home but never my PHONE… this seems like a life saver. Totally backed the phone case. One note on Starbucks. It doesn’t use a QR code, it uses a standard bar code. The scanner that reads the code off my phone is the same scanner that reads the bar code off prepackaged items that Starbucks sells. The ubiquity of this type of scanner and the availability in many stores of a hand held scanner for large items would seem to make bar codes read off a phone display an obvious choice; but perhaps I’m not overthinking enough. Hildy, nothing is as ubiquitous as mag stripe card readers they are truly everywhere. Plus, unless the POS system is programmed to accept bar codes for payment, they are only good for recording and tracking inventory. Wherever there is a barcode scanner, you will always find a mag stripe reader. Yea, but the bar code thing only works at StarBucks, I have not seen that deployed elsewhere. This thing like pushes the card number into the POS; just like you were swiping your credit card. That makes it a lot more useful to me. Their Kickstarter campaign has only been up for 3 days and they are 30% there. If that keeps up, they will have 300K in orders for this gadget. I am thinking of getting one just to play with as I am a geek and this is a really geeky toy. Stay tuned and I will let you know how it works once it happens. Does anyone know if they have a beta program running where we can get samples? What’s the point if I still have to carry around a card? Get the phone case, that is what I did! No need to carry anything with that.